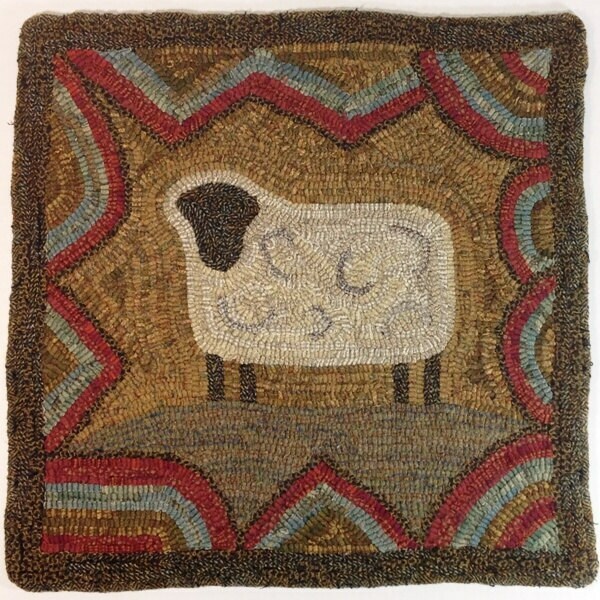 This listing is for the rug hooking pattern "Primitive Sheep". This is for the PATTERN ONLY, not the finished rug. A 4" x 6" photo comes along with the pattern. The design is 18" x 18" and is hand drawn on either monks cloth or primitive linen, your choice. 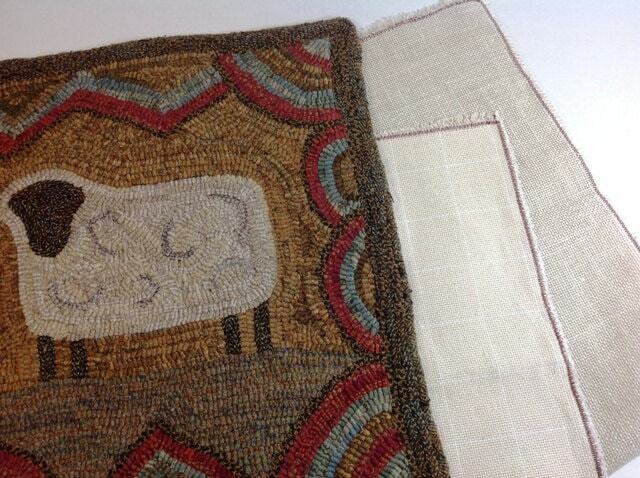 The foundation fabric has 4" borders to make it fit on most rug hooking lap frames or in a 14" hoop. The outside raw edges of the backing fabric have been served to prevent raveling while hooking. It is a fun rug to hook. Use up your leftovers for a "she used what she had" folk art look. It will hook up quickly and become a favorite in your "sheep" rug collection. For those of you planning to take a class or workshop, it would be a great choice for beginners. I hooked the background with a mix of gold textures and plaids. For the sheep I used off white and tan textured wools. The ground was a muted khaki plaid and the edge scallops various reds, blues and golds. The border and sheep face and legs are a combination of a brown/black herringbone and a brown/black honeycomb texture. © Mary Johnson/Designs In Wool. This pattern is purchased by you for one time personal use or to give as a gift one time. It may not be copied, redrawn or reproduced in any way. Please help support my small business by respecting copyright. Thank you! Beautiful pattern and it shipped same day. Great store. So Love this hand drawn pattern, ready to be punched with yarn. This design just makes me happy. Thank you for all your help.